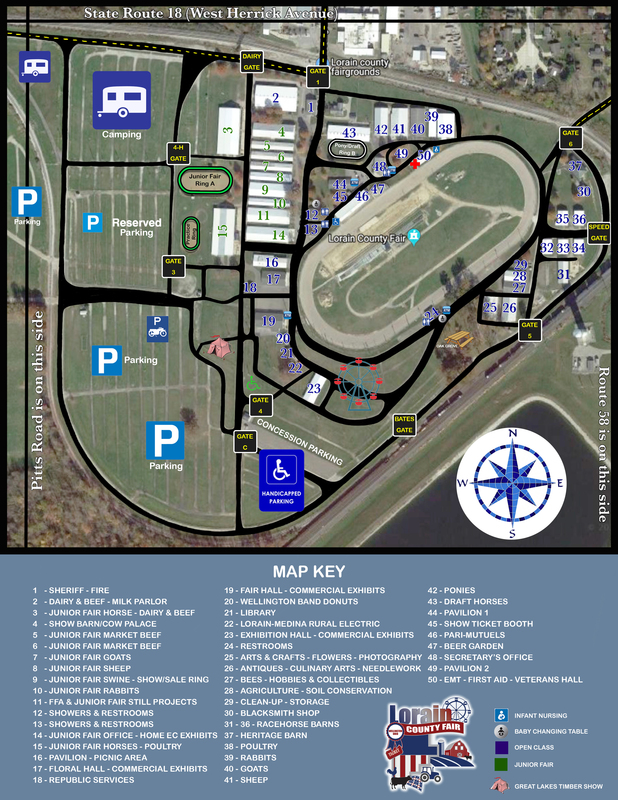 The Lorain County Fairgrounds is located off SR 18 in Wellington west of SR 58 and SR 18 (downtown Wellington). Click here for directions. To enhance Lorain County through an annual celebration promoting agriculture, education, entertainment, and encouraging positive youth development and leadership skills. NEW FOR 2018 – KIDS’ DAY!!! Lorain County Agricultural Society (LCAS) Code of Conduct states that all participants and attendees are expected to conduct themselves in an appropriate manner. If any attendee directs any disrespectful, vulgar, threatening or abusive language, and/or obscene gesture or remarks towards any Lorain County Fair representative, Lorain County Junior Fair or Senior Fair Board member, and/or any Fair staff, the attendee will be in direct violation of the Lorain County Fair Code of Conduct. Any person in violation will face disciplinary actions as deemed by the LCAS Board. Exhibitors and their families violating the Code of Conduct may forfeit premiums and/or may be banned from exhibiting for a period of time determined by the LCAS. 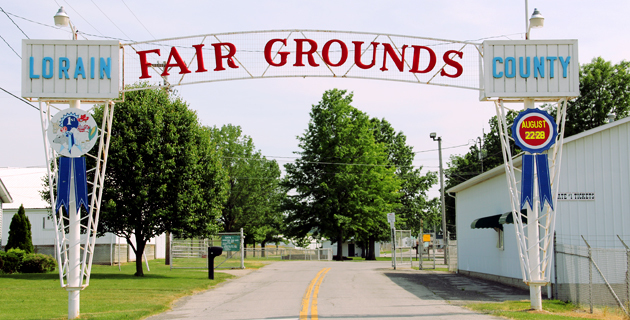 Anyone violating the Code of Conduct may be escorted from the grounds, may be subject to arrest and prosecution, and/or may be banned by the LCAS from the fairgrounds. Protests, public demonstrations, confrontational or threatening conduct, fighting or inciting riot is strictly prohibited. No person shall engage in any activity that would jeopardize the safety and well-being of another person. Anyone initiating or participating in these activities shall be removed from the fairgrounds. There will be no refund of paid admission for anyone removed for violation of these rules. Violators of these rules may be banned from attending the fair for the remainder of the week. Violators may also be subject to arrest and prosecution as determined by police officers and sheriff deputies providing security for the fair. Information is updated each year as it becomes available. Most information is updated in the month of May and is current by June 1. Any checks returned as NSF, or for any other reason, will be assessed a $35 fee, or 5%, whichever is greater. Credit/Debit cards will be taken for gate admission at Gates 1, 3, 4, and 6 – windows will be marked specifically “Credit/Debit Cards” or “Cash Only” sales. No checks taken at the gates. The ONLY difference between a Season and Membership Pass is the Membership Pass allows Lorain County residents age 21+ to vote for Directors and Constitutional changes. 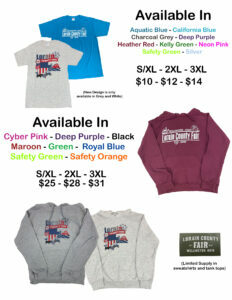 Sale of passes ends Sunday before fair. Sale of Membership Passes is restricted to two – one to the person purchasing it and spouse in the same household. Membership and Season Passes can be purchased at the Fair Office on the fairgrounds or a Season Pass can be purchased by sending a self-addressed, stamped envelope with a check payable to “Lorain County Fair” no later than August 10. Monday, Thursday, Friday & Saturday: 1-10 p.m.
Tuesday & Wednesday: 1-10 p.m.